Sektor 236 (2010) - Sci-fi-central.com. 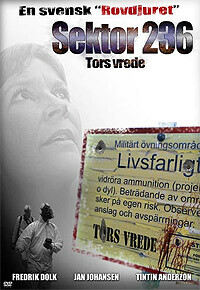 Sweden  2010   Directed by: Björne Hellquist, Robert Pukitis.  Starring: A.R. Hellquist, Fredrik Dolk, Daniel Janzen, Tina Ericksson, Tintin Anderzon, Jan Johansen, Daphne Leon, Björn Ericson, Natasha Semenets, Rickard Green, Lars Lundgren, Viktoria Hedberg, Daniela Miteska.  Music by: Fredrik Blom. A Squad of elite commandos is lost in the Swedish wilderness during a secret mission. A tactical unit is sent out to investigate. In the meanwhile a group of hikers enter the area. Their phones suddenly loses reception and the compasses stops working. One after the other they start to disappear. This movie proudly proclaims to be a Swedish "Predator", but has more in common with Plan 9 from outer space. The top-billed actors appear for only 2 minutes each, the acting is horrible, the special effect are bad and the script! The script! It's a joke. The movie is filled with strange color-filters and an annoying P.O.V. shot that involves a disgustingly awful "bulb"-like thing. I can't complain about the quality of the footage since it's low budget, which also makes the effects forgivable, but the villain is pathetic in all it's randomness. All this movie needed to make the it a full-blooded silly, camp-fest was "Long Tall Sally" and someone screaming; Get to da choppa! But despite all this, I must say that I kind of like it. It's really one of those bad movies that are so bad that they are good. Worth checking out, for the laughs. Review by AgentSniff from the Internet Movie Database.